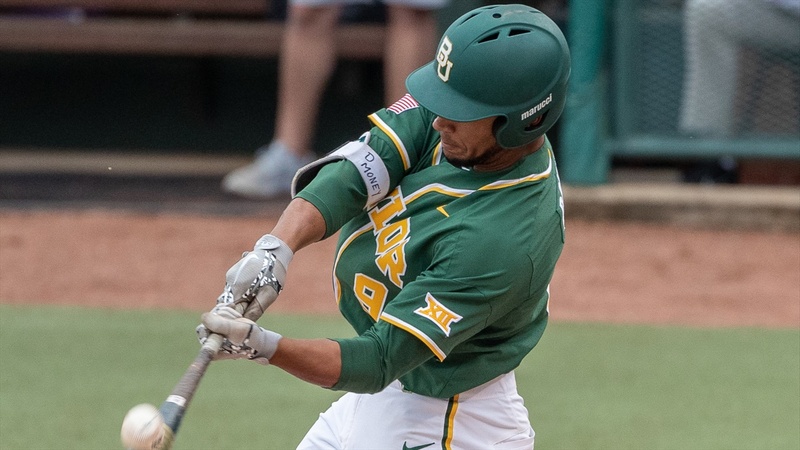 WACO, Texas – The Bears took care of business and defeated visiting Texas Southern, 13-3 in run-rule shortened eight innings on Tuesday evening at Baylor Ballpark. The Bears (17-6) drove in 13 runs on 13 hits and opened the game up with a five-run fifth inning after trailing 3-2 through the first three-and-a-half frames. The Bears then added three in the bottom of the seventh and three more in the bottom of the eighth to invoke the 10-run rule. The Bears were led by Davion Downey who drove in a season-best and tied his career-high with four RBI on a double and a triple. Nick Loftin and Josh Bissonette each drove in two runs on the day. Reliever Daniel Caruso earned the win to improve to 2-1 on the year after he tossed a career-high 4.0 shutout innings, striking out a career-best four batters. The Bears got on the board first, plating a run on an Andy Thomas RBI double. However, the Tigers (6-17) jumped out to a 3-1 lead after scoring three runs on two hits off starter Anderson Needham in the top of the second inning. The Bears added one more in the bottom of the third on a Downey double, pulling the Bears within one, 3-2. In the fourth inning the Bears broke through, plating five runs on four hits, including Downey’s bases-clearing triple to take a 7-3 lead. The Bears added three more in the bottom of the seventh and then in the bottom of the eighth the Bears plated three more runs, taking advantage of four-straight walks, a sac fly by Bissonette and an RBI single by Chase Wehsener to end the game due to the 10-run rule after the seventh inning. Texas Southern starter Alex Carrillo took the loss for the Tigers, falling to 1-6 on the year. *Baylor has won eight of its last 10 games. *Since inserting Nick Loftin in the leadoff spot, the Bears have scored 80 runs on 112 hits in their last 10 games. Loftin is 15-for-39 with 3 HR, 9 RBI and 13 runs scored during the stretch. The Bears are 8-2 in such games. *The Bears have recorded an extra base hit in 22 of 23 games this season. *Richard Cunningham led the way with three hits on the day (3-for-5). *Bissonette, Loftin and Downey each had two hits apiece on the day. *Loftin has a 10-game on-base streak. He picked up his team-leading 15thmulti-hit game of the year. *Loftin has had four-straight 2-hit performances. He is 8-for-14 over those contests. *A. Thomas extended his on-base streak to 10 games. *Haring has a seven-game on-base streak. *Downey had 4 RBI on the day, a new season-high that tied his career-high mark. *Downey recorded his first triple of the year, also added one double. *Caruso threw a career-high 4.0 innings, along with a career-high 4 strikeouts to win his second game of the year. *Needham threw 2.0 innings in his third start, sixth appearance of the year. *Gilbert threw a shutout seventh inning, his third appearance of the year. *Helmer threw a flawless eighth inning, striking out a career-high two while facing the minimum in his second appearance on the mound. 4 – Daniel Caruso threw a career-best 4.0 shutout innings, along with a career-high 4 strikeouts. The Bears are back in action tomorrow, Wednesday, March 27 at 6:35 p.m. CT against Texas Southern.